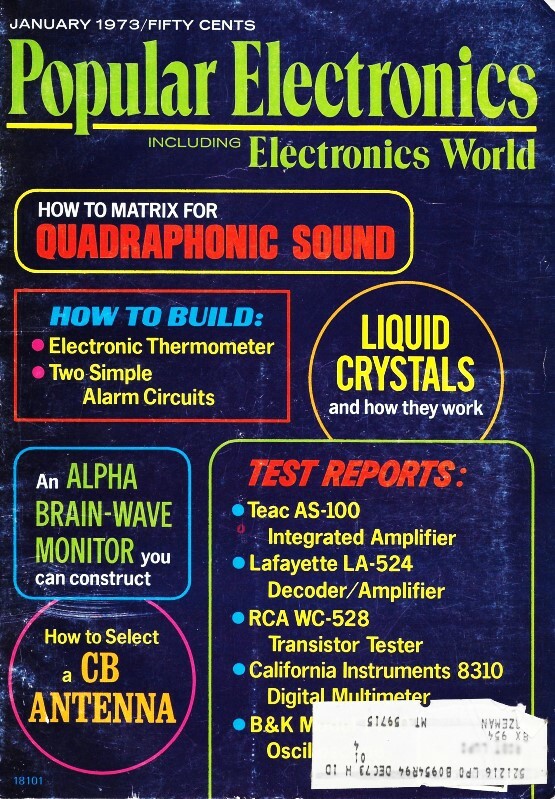 John T. Fyre, long-time author of the Mac's Service Shop series of articles in Popular Electronics, Electronics World, and Radio & television News magazines, had his finger firmly on the pulse of the commercial electronics industry. The monthly stories of goings-on with Mac and Barney in the fabled Midwest establishment might seem on the surface to be random ramblings between owner and employee, respectively; however, buried strategically within are serious issues of the day. A huge list of past installments can be found at the bottom of the page. The transition from vacuum tubes to semiconductors, and from black and white to color televisions was in full swing by 1973. Accompanying the change in components was a re-thinking of the most effective and profitable method of manufacturing and servicing the new equipment. Modularization was thought to be key to future success even though production costs were slightly higher. Reliability improvements were already reducing the need for service calls and highly trained technicians who could troubleshoot failures down to the component level. Swapping out suspect modules with known-good modules, in Mac's words, results in "a quickly trained module swapper who knows only 'how' and not 'why.'" Like it or not, that might prove to be good enough. The AN/TPX-42 IFF (Identification Friend or Foe) synthetic radar unit I worked on in the USAF used a modular approach to system design. It had more than a hundred swappable plug-in modules throughout a full 19" rack of subsystem drawers. Most modules were fairly small and only held a few dozen components each. We had a module tester for checking them. If memory serves me correctly, the design was done by AIL Systems in the late 1960s / early 1970s, so it was fairly new by the time I got to it in 1979. Mac, Matilda, and Barney had been taking inventory most of the day, but now they were taking a break. Matilda had fixed hot chocolate, and they were enjoying this with some home-baked cookies she had brought in that morning. It was snowing hard outside, but inside the service shop all was cozy warmth and the good companionship of people who enjoy working together. "Boss," Barney said, reaching for his fifth cookie, "I'm running into more and more color sets using snap-in modules. Before long, apparently, most new color sets will have these. I find I have sort of mixed emotions about this prospect. I wonder what you think of it." "I've been thinking a lot about this, too," Mac admitted, "and I've been doing some reading about the different approaches to modular construction by the various TV manufacturers and of the philosophies behind these approaches. A Business Week article says the plug-in, plug-out modules were first introduced by Motorola, Inc., in 1967 models. This may be true as far as color sets are concerned, but we both remember Setchell-Carlson's 'unitized' B & W sets which used the same basic idea of easily removed circuit sections. Setchell-Carlson was simply ahead of its time. Tubes were still being used instead of transistors, and this made the modules large and bulky and required that the contacts to the rest of the circuit carry heavy currents to tube filaments, etc. The advent of transistors really made the modular concept feasible, for then the modules could be compact, light in weight, and of low current requirements. "At any rate, other manufacturers started putting modules into a few of their sets as a sort of testing-the-water technique. Now, in the 1973 models, almost everyone has modular color sets. Magnavox Consumer Electronics Co., for example, offers modules on almost half of their 1973 solid-state color receivers." "Don't these sets cost more to manufacture?" "Yes. When Motorola introduced the Quasar model, it asked for a $100 difference in price over a conventional color set. Now it puts modules into models ranging from 14" portables to 25" units, and improved manufacturing technology has cut the price difference from $25 to $50 a set. GE, RCA, and GTE/Sylvania will not reveal the additional cost of modular inclusion. They prefer to mix the cost in with higher prices for costlier cabinets, remote controls, and touch tuning on models that use modules." Different Philosophies. "What do you mean about there being 'different philosophies' with regard to the use of modules?" Matilda wanted to know. "Well, there are a t least three different approaches to the design, assembly, and servicing of color-TV modules. Motorola puts its components on six to ten relatively large modules and charges customers $6.50 to $18.50 for a new module, exclusive of labor. The technician can either fix the old module in his shop or send it to a Motorola factory and get a trade-in allowance. Motorola then rebuilds the module and mails it back to a distributor or technician. Motorola says that, without this arrangement, the unit would cost the customer $25 to $50. We have, of course, the same arrangement in the automobile industry with regard to fuel pumps, carburetors, generators and starter drives. Admiral and Panasonic employ a similar approach." "So does the Heath Company," Barney offered. "For the first 90 days after purchase, they will repair any module free of charge and return it within two working days. After that, the repair service is equally fast, but they charge a flat $5 fee for the repair up to two years. They, of course, deal directly with the customer; so there is no labor charge for installation." "Right:'" Mac nodded and then continued: "GE and RCA want to get away from factory-rehandling costs and are working on the throw-away principle. By employing smaller, cheaper modules that contain fewer components they hope to trim module costs. RCA, which introduced three times as many modular sets this year as it did last, retails its modular units for $7 to $31 and does not give a trade-in allowance. "It seems to me a common problem for the technician, distributor, and dealer is the necessity for stocking a multitude of different modules and the likelihood of being stuck with obsolete ones as the design is changed from year to year," Barney said. "We've been down that road with tubes." Mac nodded agreement. "Motorola ran into that argument from their dealers when they introduced the Quasar, and they promised that modules would not be changed willy-nilly every year. Perhaps some kind of arrangement will have to be worked out in which obsolete modules can be traded in for new ones." A Threat to Servicing? "I can't help worrying that modules are going to make a big dent in our service business," Barney confessed. "Maybe we ought to buck them." "There can be no doubt that color TV sets require less service now than they did at first," Mac said. "Frank Moch, executive director of NATESA, says annual service calls on color sets have dropped from four to two since the introduction of transistors. He predicts modulars will lower this to 1 1/2 calls a year. But knocking modules simply because they reduce service calls would be the worst kind of sabotage propaganda. In the long run, it would be about as effective as the French peasant's trying to hold back the Industrial Revolution by throwing his wooden shoe, or sabot, into the gears of the hated machine that was replacing him and his fellows. Featherbedding and other make-work practices represent waste that first seems to cost only others but eventually costs the featherbedder his job, because those paying his unearned wages, in desperation, find a way to replace the over-priced employee. "However, I agree with you that the module poses a serious threat to servicing as we know it. First, modular sets are going to result in fewer, less-remunerative service calls. Second, most of those calls can be made by a quickly trained module swapper who knows only 'how' and not 'why.' On the other hand the module represents progress in the way of easier-to-service sets that benefit both the manufacturer and the customer. We must keep in mind that - distasteful as the idea is - service is a necessary evil. Ideally, from the manufacturer's point of view, a TV set would never need service - although I am sure the manufacturer would like a provision that the set would self-destruct at the end of a decent interval! From the customer's point of view, the set should never need service. Since this is not an ideal world, we are able to wedge ourselves in between the manufacturer and the owner and secure a grudging patronage from both. "To my way of thinking, the only way we can keep our income up or even increase it is for us to increase our productivity. Service calls will take less time; so we increase the number of calls. For all these years we've been yelling for sets that are easier to service and now we've got 'em! It behooves us to make the most of having our wish granted." "Maybe we'll get some help," Barney said hopefully. "I can see right now that if we're going to be module repairmen instead of TV repairmen we're going to need module testers, just as we now have tube and transistor testers." "I'm sure that once the dust settles, things such as that will be coming on the market," Mac agreed. "Eventually we may even see some standardization of module connections so that all will fit into two or three types of universal connectors, just as many different tubes fit the same socket. No Time to Panic. Matilda slid off her stool and began gathering up the empty cups. "As I get it, Mac," she said, "you're saying this is no time to panic. Modules are here to stay - at least until something else replaces them - and the thing for the service technician to do is to figure out how he can go with the tide instead of against it. After all, ten service calls with a gross profit of ten dollars a call is just about the same as five service calls that bring in twenty dollars a call. The technician will have to push more doorbells, but he will not have to carry along so much equipment. Lowering the profit margin but increasing the traffic is what permitted the supermarkets to crowd out the corner groceries." "That's the idea, Matilda. Some technicians will try to buck the trend just as they sneered at ac-dc receivers, pooh-poohed transistors, and finally took down their signs when color TV hit the market. But electronic servicing has never been a comfortable field for those who like things to stay the same. We are a tough breed who can roll with the punches. The fact that the average age of service technicians is over 45 years, according to what I was recently told, proves it." "That brings up a final point," Barney said. "Very few young men are coming into the TV repair field. If they get enough training to be good service technicians, they are snapped up by other services using electronics before they ever get good and started in TV repair. The apprenticeship here is too long and the pay is too short to attract youth. Now, with modular TV sets, it should be possible to train young men to do what is necessary in a comparatively short period of time. Maybe that, plus the rising income level that has been mostly brought about by organization, will attract sorely needed young men into TV repair."